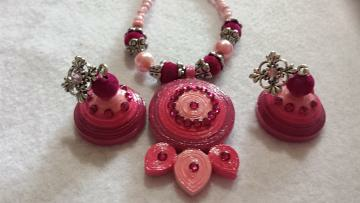 This is a mixed media set consisting of a quilled pendant and erarings. The pendant is strung on a neck piece made of seed beads, glass pearls and velvet beads. There are bead caps added to create some design and texture. A rich looking set. It is water resistant, not water proof. This set cannot be worn during activities like showering, swimming, etc. Avoid wearing it to sleep to prevent distortion of shapes. Can be gifted as a return favor at parties, get togethers, birthdays, anniversaries, etc. Colors can be customized, but there will be a slight difference in the pattern based on availability of the components and findings used. If ordering a custom color, please allow 1-3 weeks of time for the set to me made, finished and shipped. This set is completely handmade in a smoke free pet free home. Shipping Cost $6.10 Buy multiple items online from LaRa's Kreative Korner to SAVE on shipping. All Orders are processed with 2 to 3 business days. We use USPS for all shipping and the products are shipped from IL, USA. This item in Traditional Necklace Sets category was first added to our catalog on 08-15-2016. Buy Shades of pink Quilled Set, sold & shipped by LaRa's Kreative Korner where you can shop online for Handmade Jewelry, Mixed Media Art & Paintings from USA/India. This Necklace Sets collection has been tagged as Pink, Fuchsia, quilled, paper filigree, set, earrings, necklace, gift, woman, girls, mixed, beads, seedbead.